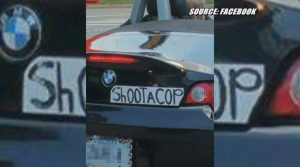 ‘Shoot A Cop’ Bumper Sticker, no problem, just free speech! A picture of a black BMW with a Virginia license plate and a plausibly homemade white bumper sticker is stirring up controversy, and for good reason. The bumper sticker on the vehicle plainly reads, “Shoot A Cop,” in bold, capitalized letters. Concerned locals contacted NBC12 about the image to ask whether it was a serious threat. NBC12 legal analyst Steve Benjamin said that, while disturbing, the bumper sticker’s message is protected by the driver’s First Amendment rights.